Most people think of Halloween today as simply a day when children dress up in costumes and go from home to home to “trick or treat” and collect enough candy to make any parent cringe. Halloween was much more significant in ancient times, however. October 31st was a very important day to the ancient Celts of Ireland, Scotland and Great Britain. No kidding around in costumes and trick or treat bags; Halloween was much more serious to the non-Christian Cults a thousand years ago. Halloween remains a popular day in the U.S., Canada, Puerto Rico, Ireland, the UK, Australia, and New Zealand. Children get to dress up in their favorite costumes and ring doorbells throughout their neighborhood to collect as much candy as possible. In the United States’ Halloween is the second most popular holiday (after Christmas) for decorating and reaps a huge financial bounty of retail selling of frightening costumes to children and adults alike, decorations and candy. But for eons, the history of Halloween encompased ancient beliefs about the world – both living and dead. Understanding the history of Halloween can perhaps help you decide what to let your children take part in, and what to keep your children away from. Also, knowing the origin of Halloween and its history can also help Christians view the adult, youth, and child activities associated with Halloween celebrations in the light of Christ’s truth. Halloween originated among the Irish Celts, Scots and Anglo-Saxons in Britain long before the Christian era. Originally called Samhain, it was a time when they believed the division between the worlds of the living and the dead became very thin and when ghosts and spirits were free to wander as they wished. The name “Halloween” is a shorter form for the Gaelic name All-hallow-evening. Pope Boniface IV instituted All Saints’ Day in the 7th century as a time to honor saints and martyrs, replacing the pagan festival of the dead. In 834, Gregory III moved All Saint’s Day to Nov. 1, thus making Oct. 31 All Hallows’ Eve (‘hallow’ means ‘saint’). On the night of Samhain, it was believed spirits of the restless dead and mischievous spirits would freely roam about with humans and during this one night spirits were able to make contact with the physical world as their magic was at its height. The Celts believed that by allowing the dead to have access to the world on this one evening, they would be satisfied to return to the land of the dead. The Celtic people would put out food offerings to appease the spirits who might inflict suffering and violence on them and Celtic priests would offer sacrifices, animal and human, to the gods for the purpose of chasing away the evil, frightening spirits. They built fires where they gave sacrifices to the Celtic deities to ensure protection from the dead spirits. Samhain was also a time when it was customary for the pagans to use the occult practice of divination to determine the weather for the coming year, the crop expectations, and even who in the community would marry whom and in what order. When Rome took over their land, the Samhain was integrated with two other Roman festivals: Feralia and a festival to honor Pomona, the Roman goddess of fruit and trees. By the time Christianity come on the scene, Halloween had already taken root from the pagan beliefs and was integrated into Christian practices. As the Europeans found their way to the New World, they brought with them their traditions which soon evolved to fit their new country. Many customs still observed today come from these ancient beliefs. For example, the elaborately carved jack-o-lantern is said to have been named after the Irish story of a greedy, hard-drinking gambling man, Stingy Jack, who tricked the Devil into climbing a tree and trapped him there by carving a crude cross into the trunk of the tree. In revenge for being stuck in the tree, the Devil cursed Jack and made him walk the earth at night for eternity. The jack-o-lantern of today is carved with a scary face to keep Jack and other spirits from entering their homes. A problem for the Celtic people was… if the souls of dead loved ones could return that night, so could anything else, human or not, nice or not-so-nice. So, to protect themselves on such an occasion, these superstitious people would masquerade as one of the demonic hoard, wearing masks and other disguises and blackening the face with soot to hopefully blend in unnoticed among them. This is the source of modern day Halloween costumes portraying devils, imps, ogres, and other demonic creatures. For Christians, the origins, history, and current practices of Halloween has its root in Satan, the author of deception. While some might say that Halloween is now only a fun children’s holiday, it should be noted how much the modern day American practices and modern day witchcraft have in common with the ancient beliefs of the Celtic people. Contrary to some beliefs, the historic Samhain was not a time for witches and the worship Satan. Samhain was the end of the crop season and the official beginning of autumn. The ancient Celts celebrated a successful crop season on Samhain, giving thanks for the bounty of the harvested crops. The satanic celebrations now observed on Halloween is a more recent invention of more contemporary Satanists who have focused more on this season as a time when the dead can easily communicate with the living therefore making divinations and sacrifices more attainable. Modern day Halloween has thus become a mixture of ancient beliefs, occult practices and a highly commercialized children’s holiday. While some people consider celebrating Halloween to be a sin, others simply feel that Halloween quite simply shouldn’t be a holiday at all! A few Southern states have been known to ban trick-or-treating on Halloween, especially when it happens to fall on a Sunday. Halloween parties are renamed “fall festivals” and children replaced scary costumes with costumes of Bible figures, historical figures, or no costume at all. Considering that Satan is the father of lies, it can be understood how many are confused and deceived about this holiday. Like Christmas and Easter, both Christian celebrations, the true origins of Halloween, a non-Christian celebration, are eons old and some of the true meanings of the traditions of these celebrations have been distorted over time. In recent times, Christmas appears to be more about presents, parades and feasts than about celebrating the birth of Jesus Christ. Traditions surrounding Halloween have followed the same fate. All too often we think of Halloween merely as a time of dressing up in costumes in going trick or treating around the neighborhood. In antiquity, the traditions of Halloween were of enormous significance throughout Scotland, Ireland and Britain. Have a spooky one! 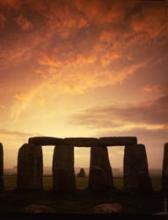 I will be at Avebury Stone Circle for the Samhain gathering.